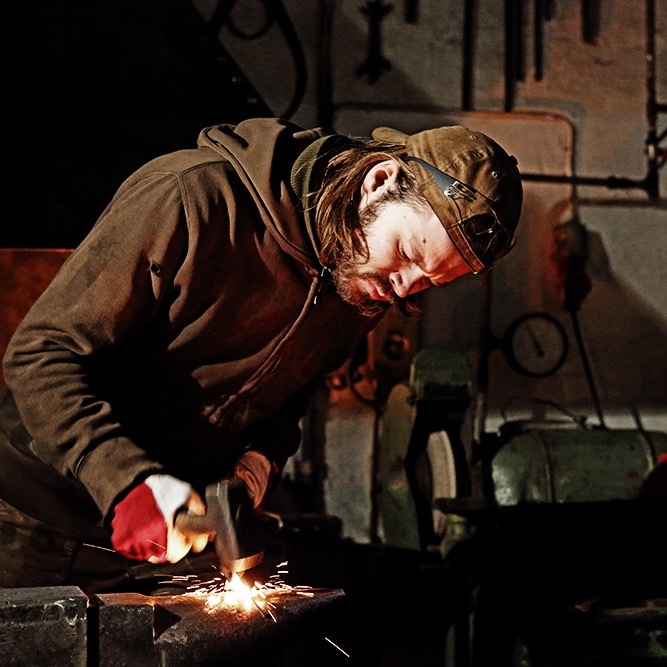 Nils Hint is a blacksmith and applied artist living and working in Estonia. His work ranges from contemporary jewellery to installation and sculpture. He sees iron in all its wonders. In his hands iron leaves its super practical world and experiences the forms outside the boundaries given to it. I have been rebelling against all the grown ups and I am still rebelling against them. If you are a rebel you don’t need any cutlery. I have some pieces at home that I use regularly. I have also used some of the bigger pieces to host my friends who came to visit my studio. Some of my pieces are multifunctional. For example spoon and wrench. I have also been using some of them as tools. I guess everything can always be improved in some way or another. In this case maybe we should instead improve ourselves and the way we use cutlery. For example it is always nice to finish your dish and not throw away food. I don’t believe in common sense inspiration. Although in everything I make I get influenced by my surroundings: space, materials and sounds. In this case some influence has came from the industrial environment of the train depot where my studio is located. Mostly I work with found iron objects. I collect old tools in my studio where they serve me both as instruments and materials at the same time. I get them mostly from the local junk yard where huge piles of scrap iron is waiting on its way to recycling plants. I am working on bigger scale pieces like sculptures. Dinner with family, dinner with friends, dinner with good food. Kitchen is the heart of my home. My favourite part of this project is that it’s about food. There are so many good artworks. I really like the Beak Pliers Spoons by Sophie Hanagarth, the Calabash Bowls and Spoons by Tala Yuan and the Coat Hanger Spoon by Stuart Cairns.